With just one click, The Wizarding World of Harry Potter comes to life, transforming computer screens and smart phones around the globe into a virtual tour of the land as Universal Studios Hollywood launches the official website for the West Coast’s much-anticipated entertainment experience, opening in Spring 2016. Hogwarts is coming to Hollywood, and the dynamic new website will sweep guests through Hogsmeade village to explore the place where magical spells and magical creatures meet dark villains and daring heroes within the soon-to-open The Wizarding World of Harry Potter, inspired by J.K. Rowling’s compelling stories and characters, brought to life in the Warner Bros. films, and being masterfully recreated with impeccable detail into a fully immersive land. Stylistically designed to be authentic to the tone and feel of the Harry Potter films, the website invites guests to virtually sample the land’s many shops, establishments and attractions through an artfully recreated parchment map. With each click of the mouse, guests will venture further into the land to uncover such specialty retail shops as Honeydukes, Ollivanders, Owl Post, Zonko’s Joke Shop, Wiseacre’s Wizarding Equipment, Dervish and Banges, Gladrags Wizardwear and Filch’s Emporium of Confiscated Goods, along with such famous eateries as Three Broomsticks and Hog’s Head pub. As their virtual journey takes them through Hogwarts School of Witchcraft and Wizardry, visitors will become acquainted with such iconic locations as Professor Dumbledore’s office, the Defence Against the Dark Arts classroom and the Portrait Gallery. Commentary from the cast, including Daniel Radcliff (Harry Potter), Emma Watson (Hermione Granger) and Rupert Grint (Ron Weasley), as well as Mark Woodbury, President of Universal Creative for Universal Parks & Resorts, is featured throughout the virtual tour. 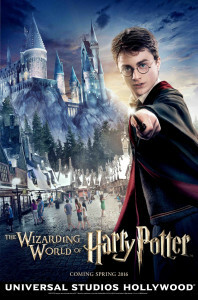 And finally, guests will have a chance to explore the multidimensional thrill ride, Harry Potter and the Forbidden Journey, which will make its U.S. debut in hyper-realistic 3D-HD to further immerse guests in the already captivating storyline, and Flight of the Hippogriff, which will be Universal Studios Hollywood’s first outdoor roller coaster. Currently, in-park guests at Universal Studios Hollywood can experience and purchase authentic merchandise, including wands, robes and other collectibles from The Wizarding World of Harry Potter, available within the Features Presentation shop, located just inside the theme park’s main entry. As the countdown to the opening continues, the website will invite guests to learn more about the Spring 2016 opening of The Wizarding World of Harry Potter at Universal Studios Hollywood by signing up for the latest news and information at www.universalstudioshollywood.com/harrypotter/signup. Join the conversation online using #WizardingWorldHollywood. Like Universal Studios Hollywood on Facebook and follow @UniStudios on Instagram and Twitter. Fans can follow Theme Park Adventure via social media on Facebook, Instagram (search our posts with #ThemeParkAdventure), Twitter, and Periscope for live streams of our travels and special events! Our most popular and unique Periscope broadcasts are archived and may be viewed on our Katch channel. This entry was posted in Home Page, Home Page Slider, News and tagged Flight of the Hippogriff, Harry Potter and the Forbidden Journey, The Wizarding World of Harry Potter, Universal Studios Hollywood. Bookmark the permalink.